For most people, the sent messages are being saved correctly but not in the folder where they expected the sent item to be. Outlook 2010 (and up) changes how accounts are handled and Sent items are stored in the account's data file. Although not a change from past behavior, Outlook 2007 and 2010 users can configure where the sent items for IMAP email accounts are stored. This option was removed from Outlook 2013 and newer. First, check your options and verify you are saving sent items. Most users will have the correct settings but you should check it just to be sure. Next, check the Sent folders in your profile. 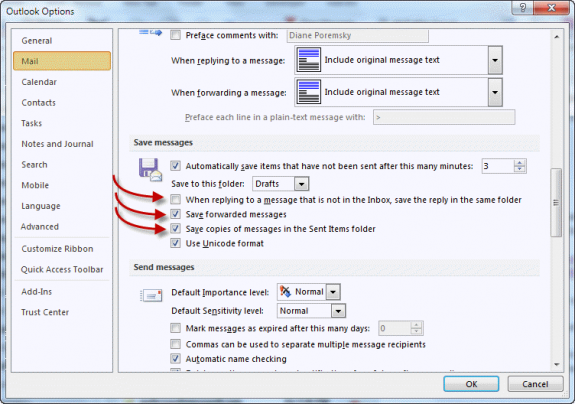 In Outlook 2010, go to File, Options, Mail and check the Save Messages options. Are you saving replies in the folder with the original? If you forwarded the message, are you saving forwarded items? Are you saving sent items? 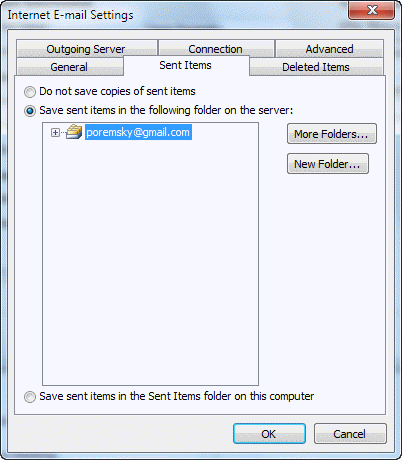 Outlook 2007 and Outlook 2010 have the ability to choose the Sent folder for IMAP accounts. Other account types save sent items in the data file where the incoming messages are stored. Go to File and open the Account Settings dialog in Outlook 2010 and newer; in Outlook 2007, it's Tools, Account Settings. Select the Sent Items tab (Folders tab in Outlook 2007) and verify where you are saving sent items. Gmail users: Note that saving sent items on the server will result in duplicate messages being saved in the sent folder because Gmail will save a copy as well. Some users report that two messages are sent, however I can’t reproduce this behavior. Autodiscover in Outlook 2013 and up will properly configure the account so you don't get duplicates. Gmail's Sent Mail folder is under the [Gmail] folder in your folder list. Other IMAP servers may use a similar configuration. By default, Outlook 2010 creates a separate data file for each email account, with separate Inbox, Drafts, Sent Items folders. The messages you send using each account are placed in the Sent Items folder in the data file associated with the account, not in one main sent folder. To locate your folders, browse the folder list and look for additional Sent items folders. To make it easier to find this folder, drag it to the Favorites list at the top of the Mail navigation pane. If you prefer, you can change where all messages for the additional POP3 accounts are placed by opening the Account Settings dialog, selecting the account and clicking the Change Folder button. We have screenshots and a tutorial at Deliver Two or More POP3 Accounts to One Data File. My "Sent" folder does not show "sent" emails,as the"inbox" does ? I click on that and it open to show the Sent email. I want to have all my "Sent" emails listed, and I can easily select the one I want ? So its just the view on the folder that is wrong? Have you reset the view? View tab, Reset button. Hi Diane, I have an Office365/Exchange setup. Outlook email displays both a 'Sent Items' folder and also a 'sent' folder. For some reason, my sent mail is getting saved in either of these folders, not just one. Where do I control which folder is used for saving all sent emails? Thank you for your time. You're syncing with a phone or tablet, probably apple? The native mail app uses a different folder - go into the device's settings, mail account and change the folder that is used for the sent items - deleted items may also be in the 'wrong' folder. This also occurs with imap accounts - outlook & phones may use different sent and deleted folders. Thanks Guys. This worked. Have been struggling to find the latest email. I use Outlook 2013. I have done 'File - Save messages - checkbox', the 'File - Account settings - Sent mail'. but all these do not work. Simply the Sent Mail folder is always empty even as all the messages are delivered. I use a gmail account. Is there anything else i can do ? Not only are the messages not saved, I don't even think they got sent. Windows 10 and Outlook have wasted too many hours of my life. I'll never buy another Microsoft product. Hi Diane - I am using Outlook 2010 without Exchange. I use IMAP. For my AOL accounts, I have the setting to save all emails in the Sent Items folder for the respective AOL accounts/AOL server. 99% of the time, that is exactly where they get saved. But then, a few here and there end up in my Personal Folders/computer "sent." I think this sometimes happens when I leave the reply open a long time before hitting send. But other times, it also happens when I reply right away. What could be causing this? This seems to happen only with AOL (never happens with Gmail mail, even though I have the same exact settings). What are the setting in File, Account Settings, More Settings, Sent tab? All my AOL accounts are set up the same. Diane, was just following up on this, I am still having the same issue. I hope you can help me. Thanks Gina. Nope, not just with the AOL accounts. I just looked through the Outlook sent items folder and I have emails sent both from AOL and Gmail. I have a *feeling* this has to do with how long an email sits in limbo while I compose it. I think if I let it sit for a long time then when I go send it it ends up in that folder rather in the corresponding account's sent folder. You could be on to something - will try those steps to repro. OK Diane. Excited to getting your take on this. Just following up on this Diane - any luck reproducing? No, i haven't been able to repro. What antivirus security software do you use? Does it work correctly if you start outlook in safe mode? To open Outlook in Safe mode: Close Outlook then hold Ctrl as you click on the Outlook icon. You'll get a message asking if you want to start in Safe mode. Click Ok.
Have you tried using online repair? I normally don't suggest it unless i'm sure it will fix it (and in the past, it often didn't), but have had a few clients recently where it actually fixed weird problems.